It's weird if you think too hard about it. 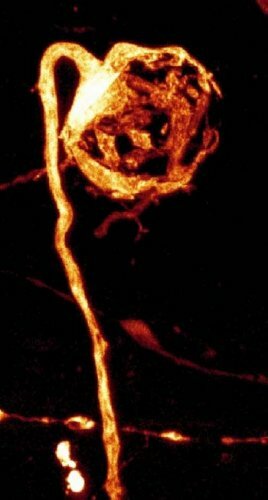 A large synapse in the mammalian auditory central nervous system, so named by German physician Hans Held in 1893 because of its resemblance to the calyx of a flower. The related endbulb of Held is also a large axon terminal smaller synapse found in other auditory brainstem structures such as the cochlear nucleus. As with the calyces, these synapses promote fast, efficient information transfer. 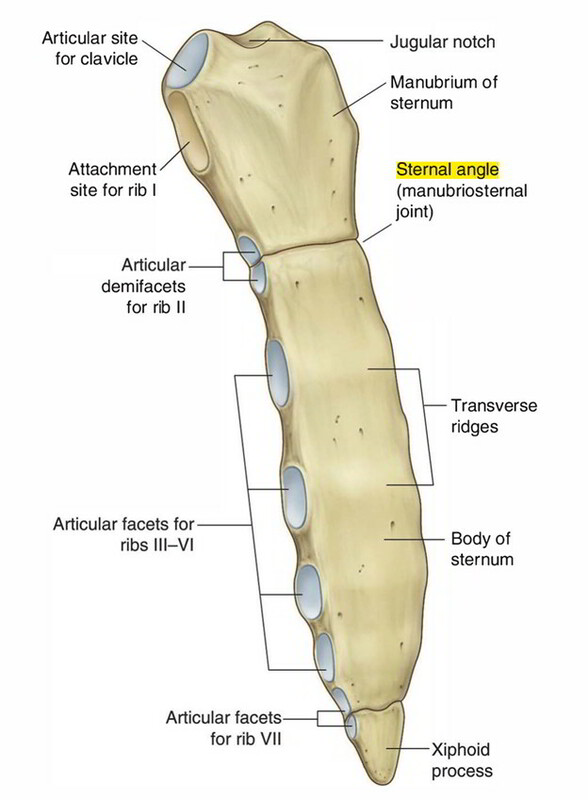 The sternal angle, the anatomical feature formed from the manubriosternal junction (the joint of the sternal body and the manubrium). The angle is a palpable clinical landmark in surface anatomy, measuring around 162 degrees in males; it marks the approximate level of the second pair of costal cartilages, which attach to the second ribs. Named after 18th-century French surgeon and physiologist Antoine Louis, who is also credited with designing a prototype of the guillotine that, for a time after its invention, was called a "louisette." The posterior lining membrane of the eye's cornea; a thin hyaline (glassy and translucent) membrane between the substantia propria and the endothelial layer of the cornea. Also called the Spiral Organ; a complex epithelial structure in the cochlea of the mammalian ear that contains thousands of hair cells, rests on the internal surface of the basilar membrane, and is the chief part of the ear by which sound waves are perceived and converted into nerve impulses that are transmitted to the brain. Italian anatomist Alfonso Giacomo Gaspare Corti discovered the organ of Corti in 1851 after studying at least 200 cochleas of man and different animals. Also called the convolution of Broca; a region in the frontal part of the dominant hemisphere of the brain, usually the left, that contains neurons involved in speech function. French surgeon Paul Broca discovered this region's role in generating articulate speech in 1861, after studying two patients who'd lost the ability to speak when they sustained injuries to the posterior inferior frontal gyrus (pars triangularis) of their brains. A branch of the heart's anterior internodal tract on the inner wall of the left atrium. This band of cardiac muscle passes from the right atrium between the superior vena cava and the ascending aorta. During normal sinus rhythm, this is the path for the left atrium's electrical activation. Bachmann's bundle was named for Jean George Bachmann, who discovered via canine experiments that that clamping this muscular bundle of fibers caused a significant conduction delay in the heart. 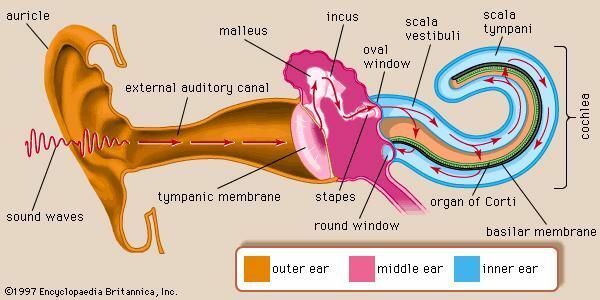 The auditory or pharyngotympanic tube, which links the nasopharynx to the middle ear and is part of the latter. It was named after the 16th-century Italian anatomist Bartolomeo Eustachi, one of the founders of the science of human anatomy. A laryngeal prominence of the human neck, formed by the angle of the thyroid cartilage surrounding the larynx; seen especially in males. The origin of the term is uncertain; the most popular story is that it was named for a piece of forbidden fruit that became lodged in the throat of the biblical Adam, but some linguists believe that the term came from a mistranslation of the Hebrew name "Adam," which means "man." The large and prominent tendon of the gastrocnemius and soleus muscles of the calf, named, of course, after the Greek hero of the Trojan War, said to be invulnerable throughout his body except for the heel of his foot. Because it had been foretold that he would die young, his mother Thetis dipped his infant body into the River Styx--doing so was supposed to confer powers of invulnerability. But she held onto him by his heel, thus preventing the magical water to wash over it and leaving him with a single point of weakness. Not surprisingly, he was killed when a poison arrow lodged in his heel.